For the last 2 years, John has dreaded winter colds. “I have never liked the winter months much anyway, but every time I get a cold that leads to a cough, I know I am in for a couple of weeks of misery,” he says. John suffers from a fairly rare form of headache called a cough headache. It is not difficult to imagine the symptoms; every time John coughs a deep cough he experiences intense, needle sharp pain in the back part of his head that lasts anything from a couple of minutes to half an hour. “It’s been a very strange experience – I have developed a fear of getting the headaches, a fear of coughing and so a fear of colds – it’s made me quite paranoid,” says John. In the early days, when he realised that coughing was the trigger for his headaches, John began to avoid all forms of public transport, particularly air flights and trains. “At least you can get off a bus if someone starts coughing nearby and then wait at the stop for the next one, or walk. 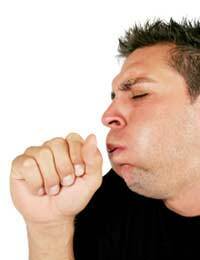 On a long train or plane journey, you are stuck there, inhaling the germs for hours,” he explains. John explained that, for no reason he could think of, every time he coughed he would experience an intense, one-sided pain in the back of his head. This was not linked to feeling sick, dizzy, seeing lights or having any other symptoms. The length of time was very variable but, at the worst point of his infection, John’s headache was more or less full on all day because he was coughing so much. “The first thing the GP did was to prescribe some antibiotics and a course of steroid via an inhaler as I apparently had some wheezing. It still took a couple of weeks before the cough started to subside. She then suggested that I needed a bank of tests to make sure that there wasn’t something serious going on that was causing the headaches,” says John. After undergoing a CT scan, X-ray and other tests, John was declared free of anything like a brain tumour and he didn’t seem to have any brain damage, to have had a stroke, or to be suffering from blocked up blood vessels. “When everything else was ruled out, a formal diagnosis of cough headache was made. Apparently, this type of headache, although rare, is more common in people over 40. As I am 47, that made sense but no-one really knows why it happens in one in every hundred people,” says John. The typical pattern seen in people with cough headaches is that the attacks wear off gradually on their own, usually in about 2 years. John was rather disappointed when he was told this as he assumed he would be left to suffer in silence. “In fact, I went through quite a rigorous consultation with a migraine and headache specialist and was given medication to take in the form of a nasal spray during times when I was prone to coughing. That really helped – it was much more successful than I ever expected,” says John. Being less afraid of developing the headaches released John from some of his anxieties and he was able to reduce his isolation, work normally for months on end and he took up hiking as a form of exercise. “Whether it was just time, or the healthier lifestyle, or the fact I wasn’t worrying so much, I haven’t had a cough headache now for over three months – I can’t be sure yet that it’s all over, but I certainly hope so,” he laughs.